If you practice meditation, you know what it's like to be sitting and wondering if you've finished your 20 or 30 minutes, or if you've sat for hours without realizing it. Sometimes, five minutes can seem like an hour, or an hour can seem like a few minutes. Some people may use their watch or a clock to know when their allotted time has ended; others may want to use a timer. The App Store has no shortage of meditation timer apps, which can not only count your time, but also play sounds to let you know when your time is up, or at regular intervals to remind you of your progress. Here are five of the best meditation timer apps. Insight Timer's interface isn't snazzy, but the app has a full range of social features. Insight Timer (free; iOS and Android) is one of the most popular meditation timers. You set the amount of time you want to sit, then set optional starting bells and ending bells, as well as interval bells at the duration you choose. Insight Timer also has a social aspect—you can see who else is meditating at the same time as you, and keep notes about your meditation if you want. The app also contains a number of audio-guided meditations, if you're new to meditating, and keeps stats, so you can ensure your regularity on the cushion. Esthetically, it's not the most attractive app in this area, but it does the job. Some of the features are only available with a $3 in-app upgrade, but even the free version does most of what you need. Samsara offers a spartan interface that doesn't distract. Samsara ($4; iOS) is a minimalist app that lets you set a duration, starting and ending bells, optional interval bells, and can even give you notifications to remind you to meditate. It also stores statistics, but doesn't have any social network features like Insight Timer. Its display is simple: A circle that shows progress, with an optional digital clock in its center. The free version, Samsara Lite, limits the amount of time for sessions, and lacks a few other features, so if you meditate regularly, it's worth paying for the full version. It's got the cleanest interface of the meditation timers I looked at, and its simplicity makes it a great choice for those who don't want a timer to require too much thought. Self combines a simple interface with some advanced features. Self: A Meditation Machine (free; iOS) is another minimalist timer with in-app purchases to unlock features. It has sounds, a journal, statistics, and reminders. 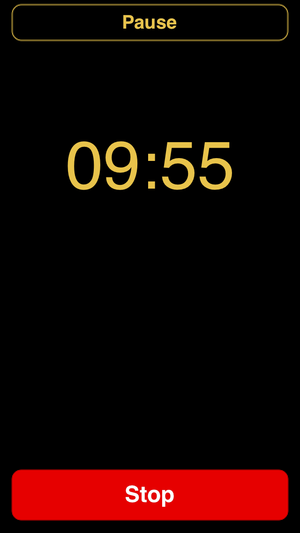 The timer itself is one-tap simple: It displays four times, and you just tap one to start counting. A circular display, like an iPod click wheel, shows your progress, with a digital clock below it. Self offers lots of in-app purchases, for sounds, and for a "Pro Timer," which lets you choose times other than the default 15, 30, 45 and 60 minute settings. You can export your meditation stats in CSV format to open with, say, Microsoft Excel, and you can share you meditations on Twitter. 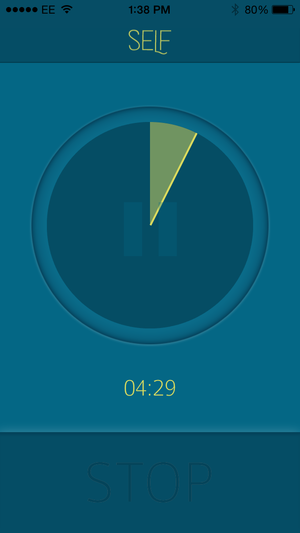 Zenso Meditation Timer (free; iOS) has limited features, but is enough for many meditators. Choose a time, and choose intervals if you wish, then select from a number of bell sounds. 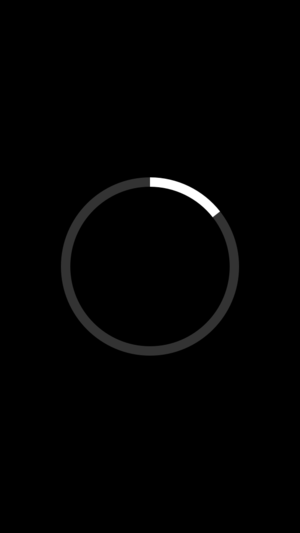 The app displays a digital clock surrounded by an enso, a type of Japanese circle, which starts out all gray, and gets darker as time elapses. Mind shows you nothing; no time, no progress. It just plays a bell at the end of your session. I've been using the word "minimalist" a lot in this article, because the goal of many of these apps is to not distract you. Mind (free; iOS) is probably the most minimalist of all meditation timers. Swipe the rainbow bar to set a time, and then tap to start counting. Mind plays a gong when the time's up. That's all it does. It doesn't display time—which can be a bit of a problem, if you think you've been sitting a long time, and need to check—and there are no settings to choose a bell sound, which most other meditation timer apps let you do. However, the bell sound is nice, and if you just want to sit and not be bothered by anything other than a reminder when your time's up, this might be just what you need. With all these choices, you'll find it easy to pick an app that suits you. Some are simple, and some offer more complex features, but all of them may help you keep a regular meditation practice without looking at your watch or your iPhone’s clock to see how much time has passed. 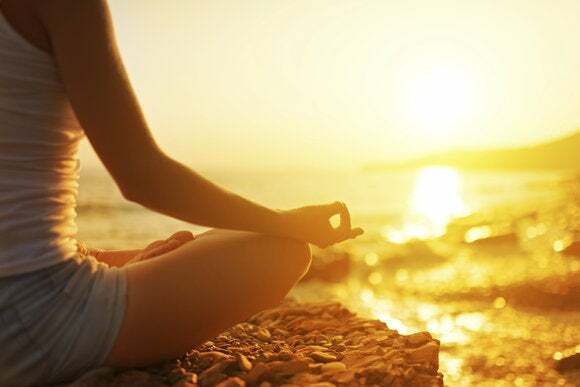 This story, "Five timers just for meditation" was originally published by TechHive.